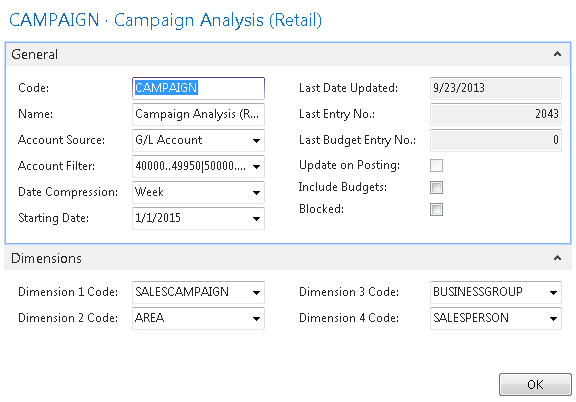 Now that you know you can use dimensions with account schedules, how do you do it? You need to create an analysis view. Analysis views give us the ability to reach into our dimensions, past the two globals, and into the full list of dimensions, allowing us to combine any four dimensions we want at a time in any account schedule. If you don’t use an analysis view, you’ll still be able to get to your global dimensions as shown below. 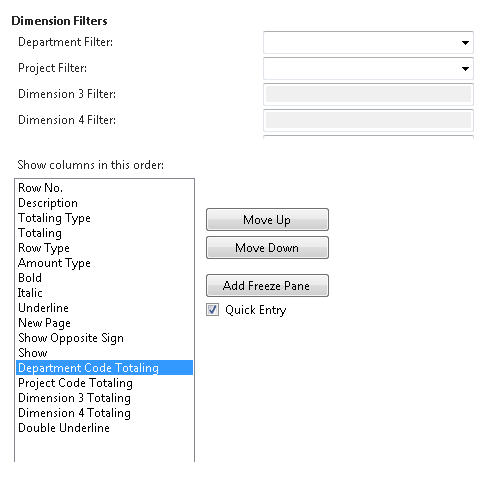 The two global dimensions for CRONUS USA (Department and Project) are available to be selected on the dimensions filter tab and the remaining options are grayed out, unable to be used. 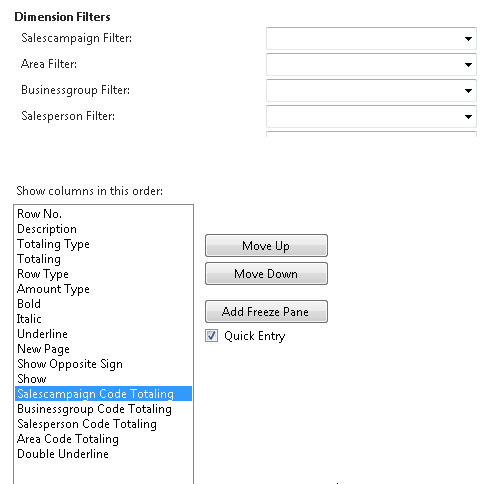 By selecting a different analysis view on the account schedule name page, you will have expanded options. Perhaps you’d like to apply an entirely different set of dimensions filters to your account schedule or limit the dimensions filters to only two of your shortcut dimensions. Any combination of four dimensions is available to you through analysis views. 1. You can add a default analysis view to any account schedule. If you always want a certain account schedule to filter on a selected group of dimensions every time you open the report, this is the best way to do this. 2. Analysis Views must be updated. You can do this at any frequency you wish. Some companies choose to update once a month, some companies update once a day. Be aware that the process of updating pulls in any transactions that have been posted since the last update to your analysis view. This means if you post some entries during your close process, you’ll need to update your analysis view in order to show the change on your account schedule. 3. Updating can be done manually or it can be automated. To manually update analysis views, just hit the update button. You’ll need to do each view separately. Alternatively, you can choose to schedule codeunit 410 Update Analysis View as a regularly scheduled maintenance item in order to automate this process. 4. When you set up an analysis view for the first time, it can take a long time to update. Depending on the size of your database, if you don’t limit how far back your update goes, it could take a long time to update initially. Be careful by trying this out in a test system first. This process, which will normally take seconds when run daily, will take many hours if you don’t limit it and will cause table locks for other users. If you test out an update and are afraid it will take up too much processing time, you have a couple of options. First, you can limit the start date of your update. One reason you might need a new analysis view is because you’ve added a new dimension. In this case, you really don’t need to go back to the beginning of time on your update. Choose the date you started gathering data on your new dimension as your starting date. You can also choose date compression. By compressing your data by day, week, month, quarter, period, or year, you limit how much detail you can see when you drill down. If you use this option, you’ll need to remember that this is a compressed view if you change column layouts to a different time frame than your compression setting. Choosing date compression of none will allow you to drill down to full transactional detail. 5. Avoid using the update on posting button. This option updates your analysis view every time you post something to your system. Every sales order, every sales tax entry, every cash receipt, etc. will update real-time. I’ve seen one small company use this option and it brought their system performance to a crawl. 6. Remember to include your budgets. If you make any changes to your budgets, you need to update that information on your analysis views as well.